Today’s article is made up of three sections. The first section provides an overview of IFRS 16 and a glimpse of the transition considerations for lessees because of the new international lease accounting standard. The second part answers how to transition from an operating lease under current IAS 17 to the single lessee accounting model – a finance lease using the cumulative effect approach. It also provides a detailed example of the cumulative effect approach or modified retrospective method with the accounting entries that illustrate the transition impact of IFRS 16. The third and final section provides a detailed example of the full retrospective approach with the accounting entries that illustrate the transition impact of IFRS 16. Overview: Under IFRS 16, a lessee accounts for a lease under a single lessee accounting model – a finance lease. Effective Date: IFRS 16 is effective for annual reporting periods beginning on or after January 1, 2019, with earlier application permitted (if IFRS 15, Revenue Recognition, is also applied). *Helpful Tip: The election chosen MUST be consistently applied to ALL leases in which the company is a lessee. Option A: If the full retrospective approach is chosen, apply the guidance under current international standard IAS 8, Accounting Policies, Changes in Accounting Estimates and Errors. Option B: If the cumulative effect approach is chosen, a lessee does not restate comparative information. Instead, the lessee shall recognize the cumulative effect of initially applying this Standard as an adjustment to the opening balance of retained earnings (or other component of equity, as appropriate) at the date of initial application. An amount equal to the lease liability, adjusted by the amount of any prepaid or accrued lease payments relating to that lease recognized in the statement of financial position immediately before the date of initial application. Apply IAS 36, Impairment of Assets to right-of-use assets at the date of initial application as applicable. The Cumulative Approach and Finance Leases under IAS 17: If the cumulative effect approach method is chosen, the carrying amount of the right-of-use asset and the lease liability at the date of initial application shall be the carrying amount of the lease asset and lease liability immediately before that date measured applying IAS 17. For those leases, a lessee shall account for the right-of-use asset and the lease liability applying this Standard from the date of initial application. Helpful Tip: Under the cumulative effect approach, a lessee does not restate comparative information. Here is an ebook, written by accountants, of the IFRS 16 transition for an operating lease from current IAS 17 to IFRS 16 for lessee accounting. Step 2: Determine the right-of-use asset on a lease by lease basis using 1 of 2 options explained below. Step 3: Adjust the right-of-use assert for impairment under IAS 36 if applicable. To see my blog on how to calculate the present value of the remaining lease payments, click here. The remaining payments of $60,000 less the total interest expense of $10,827 equals a lease liability on transition of $49,173. Note: Comparative period information does not change in this scenario. Step 2: Determine the right-of-use asset amount on a lease-by-lease basis using 1 of 2 options. To see my blog on how to calculate the present value of the right-of-use asset since the commencement date, click here. Using Option 1, the lessee takes the cumulative beginning balance or carrying amount of $44,161 which has been discounted at 6% to determine the right-of-use asset amount. Option 2 – Amount equal to the lease liability, adjusted by the amount of any prepaid or accrued lease payments recognized immediately before the effective date. Using Option 2, the lessee makes the right-of-use asset as an amount equal to the lease liability of $49,173 determined in Step 1. In this scenario, there were no impairment indicators noted per IAS 36. What is retrospective application in accounting? Retrospective application means adjusting the opening balance of each affected component of equity for the earliest prior period presented and the other comparative amounts disclosed for each prior period presented as if the new accounting policy had always been applied. 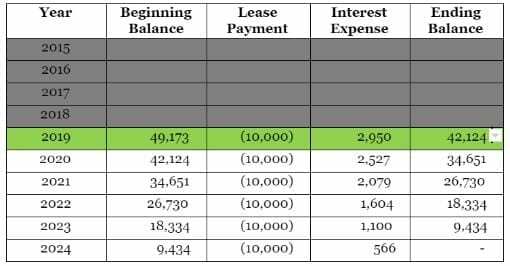 Calculate the initial lease liability as of the commencement date and calculate the subsequent lease liability using the effective interest method. Calculate the right-of-use asset as of the commencement date and calculate the subsequent right-of-use asset by depreciating the ROU asset. Step 1: Calculate the initial lease liability as of the commencement date and calculate the subsequent lease liability using the effective interest method. Step 2: Calculate the right-of-use asset as of the commencement date and calculate the subsequent right-of-use asset by depreciating the ROU asset. And there you have it, how to complete a full retroactive approach for lease journal entries. If you need to comply with the upcoming changes to lease accounting, we can guide you through the process. Click the button below to get started. I recalculated your first worked example above — thanks for that. The only way that I could get it to work was if the payments are in ADVANCE and not in ARREARS. I can send you my Excel sheet to see my workings if you like. Regards from Abu Dhabi. CHARLES ARNESTAD CA(SA), CFA. Hi Charles – The payments made in arrears are discounted as if made at the end of each period. For a calendar year entity, think of each payment being made on December 31. We would be happy to take a look at your excel spreadsheet to assist you with the calculation, as well as any other questions you might have. Additionally, LeaseQuery provides a free Present Value Calculation tool in Excel within the Free Tools section of our website. See below for a link. Thanks for your examples and clear explanations. hi if my reporting date ends on 30th April 2019…. under the retrospective application….the earliest reporting date would be 1 May 2017 ya? Hi Mary. If you report two comparative periods within your financial statements, the earliest reporting period would be the fiscal year ending April 30, 2017. Thank you, this is explained very well and its easy to understand. I have a question regarding variable payments. In office/building lease contracts, it normally includes both Committed Lease Rental plus operating costs. When you calculate Lease Liability, would you consider both these components or just the committed lease rentals? If we were to consider Operating costs as well, how would be determine it for the overall lease period, as it varies year over year. Hi Shivam – You would only include the committed lease rentals when discounting payments to calculate the lease liability. As the operating costs vary annually, you would expense these amounts as incurred throughout the life of the lease. Hi, Jason. your posing helps me a lot to prepare calculation template. I appreciate it. I have a few question on this new lease accounting. 1. Under new lease accounting, no rent expense for the financial year as they are reflected to decrease liability and Depreciation expense. Hi Cara – I’m glad we could help! Your journal entries are correct for Example 1, Option 2 in the article for the year-end 2019. Let us know if you need further clarification on other matters. Thanks Jason. I really appreciate.